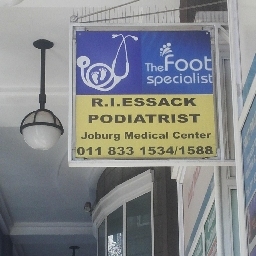 Dr. Ridwaan Essack is a qualified Podiatrist from the University of Johannesburg. Dr. Essack’s practice at the Joburg Medical Centre is conveniently located in the heart of the Johannesburg CBD at the FNB Bank City. Dr. Essack specializes in treatment of the lower extremity which includes hip, leg, knee, ankles and disorders of the foot. Dr. Essack provides general foot care for patients as well as treatment for patients struggling with skin and nail diseases, ulcers, fractures and deformities. Dr. Essack also specialises in Pediatric foot care, abnormal lower limb and development. The Joburg Medical Centre offers foot care to disabled or elderly patients not able to reach their feet and wound management for diabetic patients. Dr. Essack also provides patients with prevention education on how to treat foot problems. The Joburg Medical Centre located in the Johannesburg CBD has safe and secure parking.